The circulatory system consists of a driving blood pump – the heart, and a system of blood vessels – arteries and veins. Arteries supply blood to all tissues to provide oxygenation and nourishment at the cellular level. Veins return blood to the heart with a high content of carbon dioxide. Excess liquid (~10%) accumulated in the (intracellular) interstitial space that cannot be reabsorbed by the venous capillaries is known as lymph and forms within a second circuit of circulation; the lymphatic system. The lymphatic system transports fluids, nutrients, and wastes exuded from tissues back to the bloodstream through connections of lymph vessels with major veins. The lymphatic system does not have any source of pumping and transports lymph slowly toward the heart due to the breathing movement and the movement of muscles and the circulatory system. Impaired lymph circulation may cause accumulation of fluid in the intracellular space and that would contribute to cellulite and swelling. Presotherapy is widely used in aesthetic medicine, angiology, physiotherapy and rehabilitation for improved blood flow circulation and lymph drainage. Presotherapy is performed with an aesthetic medical device especially designed to increase blood circulation and lymph drainage via soft yet effective tissue massage. The use of a pressure therapy massage system provides activation of both the venous and lymphatic circulation, thus stimulating the reabsorption of interstitial fluids that are not absorbed by the venous system, favoring its drainage into the blood vessels. Increased blood circulation provides better oxygen supply to tissues and thus increases metabolic rates and assists in slimming. High level of oxygenation also facilitates cell regeneration and improves skin tone. Increased lymph drainage helps to eliminate metabolic waste from the tissues and therefore provides general detoxification of the body. Improved blood and lymph circulation helps to relieve muscle pain and it improves the digestive system by relaxing abdominal and intestinal muscles. The main Presotherapy accessory is the boot, responsible for exercising pressure on the patient’s body. It is designed to adapt perfectly to the treatment area, from the feet to the abdominal area, with the aim of exerting a uniform pressure over the entire surface, thus guaranteeing maximum efficiency. The boot has separate chambers, which inflate and deflate sequentially, depending on the type of program that is selected (e.g. for blood circulation, deep lymphatic drainage, etc). This treatment is very comfortable and relaxing. It usually takes 20 to 45 minutes depending on the choice of the treatment program. WHAT ARE THE MOST COMMON INDICATIONS FOR PRESOTHERAPY? 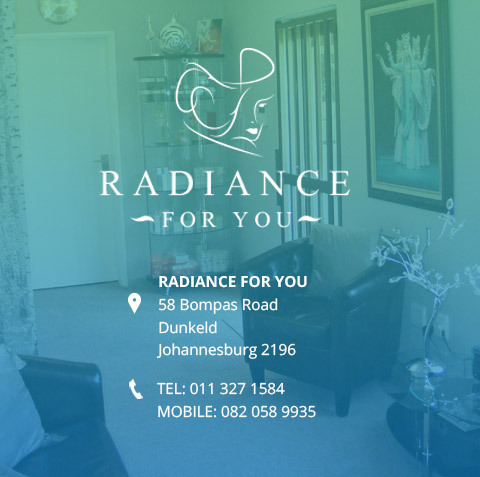 At Radiance for you we combine presotherapy with VelaShape treatments for an optimal effect on cellulite and body contouring.